When considering extraterrestrial intelligence, most science fiction tends to think of intelligent beings inhabiting protoplasmic bodies. Those protoplasmic bodies may look very odd, with all kinds of weird appendages and strange facial features. But the basic model of consciousness is not radically different from mind as we know it: a single consciousness inhabiting a single protoplasmic body. But there are many other very different possibilities. The universe is believed to be about three times the age of our planet. Intelligent life may have evolved on other planets many millions or billions of years before it appeared on our planet. Having had vast eons to develop, intelligence may have evolved into strange forms vastly different from the “single brain in a single body” that we are used to considering. Let us consider some of the possibilities. Group minds. On some planets, the minds of individual organisms may be united into some kind of group mind or planetary consciousness. Such a group mind could be a permanent linking, as imagined by the Star Trek series, with its depiction of the Borg. Or such a group mind may be only a temporary linking, something to be achieved on only particular occasions. We can imagine a planet in which people are individuals 90% of the time, but become linked into a group mind 10% of the time. Planetary electronic minds. On some planets, there may be no individual bodies with minds. There may be a single electronic planetary mind. Such a planetary mind may have an army of robots at its command to fulfill its wishes. Such robots may have no consciousness of their own, but may be merely agents of the planetary electronic mind. If you were to connect ten robots to a human mind, the human would not be able to productively do the multitasking needed to operate those ten robots at the same time. But an electronic planetary supermind might have no such problem, and might be able to control thousands or millions of robots at the same time. Body-switching minds. Once some alien civilization has learned the secrets of consciousness, it may find a way to do things with consciousness we could never dream of. The inhabitants of such a civilization may be able to switch their minds from one body to another, whether robotic or protoplasmic. We can imagine a society where someone might put his body into hibernation for the weekend, and have his mind inhabit a robot body for the same weekend, switching back to his original body at the end of the weekend. Or particular individuals might switch bodies for a particular length of time. Such a switch might be as easy as connecting two individuals to some fancy electronic device that connects with their brains. Disembodied shape-shifters. In the X Men comic books and movies, a character named Mystique is depicted as a genetic mutant who can shift shape to resemble any human. It is ridiculous to imagine that any genetic mutation would give humans such a power. But if some superadvanced alien race were millions of years older than ours, and had evolved into a disembodied state, the members of such a race might have the ability to temporarily materialize themselves into a tangible form. A disembodied intelligence might be a cloud of atoms or subatomic particles; and if such particles were a conscious mind, such a mind might be able to temporarily reorganize itself into a variety of physical forms. Even if a disembodied intelligence were pure energy, energy can be converted to matter, and matter converted to energy. So if you were a member of a superadvanced race on another planet, you might start your day not by asking yourself “what should I wear today?” but instead “what should I be today?” with the possible answers including a male, a female, some other type of organism, a fish, a plant, a car, or who knows how many other possibilities. Even if your disembodied cloud didn't have all the types of particles you needed, you could probably grab some of the needed particle types from the air, the soil, or miscellaneous objects lying about. Conscious starships. When we think of interstellar spaceships, we always to tend to think of beings traveling in a spaceship. But many civilizations may have discarded such an idea, in favor of making starships themselves intelligent. When a starship arrives on our planet, the only intelligence in it may be a conscious intelligence housed in the electronics of the starship itself. 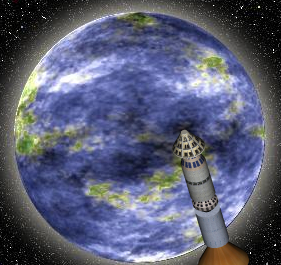 Such an intelligence may launch robots to explore a planet, and such robots may be merely mobile eyes and ears for the electronic intelligence within the spaceship. Such conscious starships may be more practical for interstellar voyages that might require thousands of years. I offer this idea to any sci-fi novelist who may wish to write an epic novel told in the first person, one entitled I, Starship. Migrating mind-clouds. If a superadvanced extraterrestrial civilization were to evolve into a disembodied state, it might not be content to hang around its original solar system. Being freed from the needs of food, water, and oxygen, a disembodied mind might launch itself across the interstellar void in search of adventure. Such migrating mind clouds may now be hanging around our planet. One does not rebut such a possibility by saying that there is no evidence that such mind clouds are communicating with us. A disembodied superintelligence may regard us as we regard insects at our feet – something too stupid to be worthy of communication, but merely something to be studied. 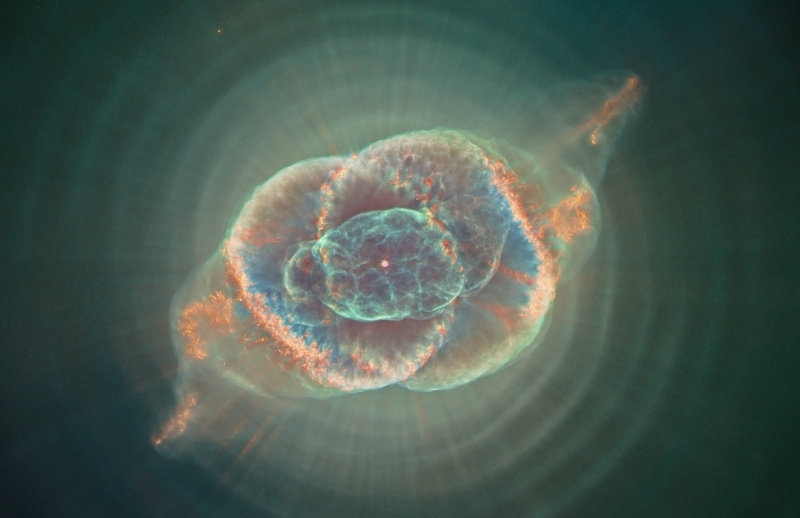 Planetary nebula or migrating mind cloud? Galactic superminds. Civilizations millions of years older than ours may have discovered some way to achieve instantaneous communication with other civilizations. So rather than just considering the idea of a planetary supermind uniting all the minds on a single planet, we can also consider the possibility of a galactic supermind uniting the minds on a million far-flung planets. If you were to encounter such a supermind, it might be easy to mistake it for a deity. In 2012 NASA released a light map of planet Earth made from observations by an orbiting satellite. The map was made from data acquired over nine days in April 2012 and 13 days in October 2012. Most continents appeared as expected. For example, the map of the United States showed many lights around the east coast, but not much light around the Rocky Mountains. But the light map had one big surprise: there were many lights shown over the eastern half of western Australia. The eastern half of western Australia has little population. So how could there be all these lights coming from such a sparsely populated area? In 2012 NASA made an attempt to explain this mystery. NASA claimed that the abundant lights in the eastern half of western Australia were caused by wildfires. It is known that the eastern half of western Australia is pretty dry, so this explanation seems to have been accepted without challenge by the press. There are two huge problems, however, with NASA's explanation. The first is historical. If there had been huge wildfires in the eastern part of western Australia during the time the data for the light map was collected (nine days in April 2012 and 13 days in October 2012), there would be a historical record of such fires. But there seems to be no such historical record. This wikipedia article discusses in depth the Australian bushfire season between 2012 and 2013. The article devotes 4 paragraphs to the month of October 2012, and mentions a huge wildfire in eastern Australia (in the Queensland region), one that consumed a million acres. But the only discussion of fires is western Australia is a discussion of a relatively tiny fire that only consumed 2500 acres. Such a fire can account for perhaps only one dot on the map showing “mystery lights” in western Australia. As for April 2012 this article discusses the fires between June 2011 and May 2012, but makes no mention of any fires in April 2012. Wildfires mostly occur in Australia between October and February. I did a Google search for “fires in Western Australia” with the results restricted to between October 1, 2012 and November 1, 2012. I could find no mention of any fires in western Australia during this period, except for a discussion of the relatively small 2500-acre fire previously mentioned. I then did a Google search for “fires in Western Australia” with the results restricted to between April 1, 2012 and May 1, 2012. I could find no mention of any fires in western Australia during this period. Among the sites I found was one called wildfiretoday.com which allowed me to search results by an “Australia” tag. There were many detailed accounts of wild fires in Australia between 2011 and 2015, but none covering fires in western Australia in April 2012 or October 2012 (except for the relatively small fire previously mentioned). In short, the historical record does not support the claim that there were huge wildfires in western Australia during the two months when the data for the NASA light map was collected. But NASA did provide something in an attempt to back up its claim that the “mystery lights” in western Australia were caused by wildfires. 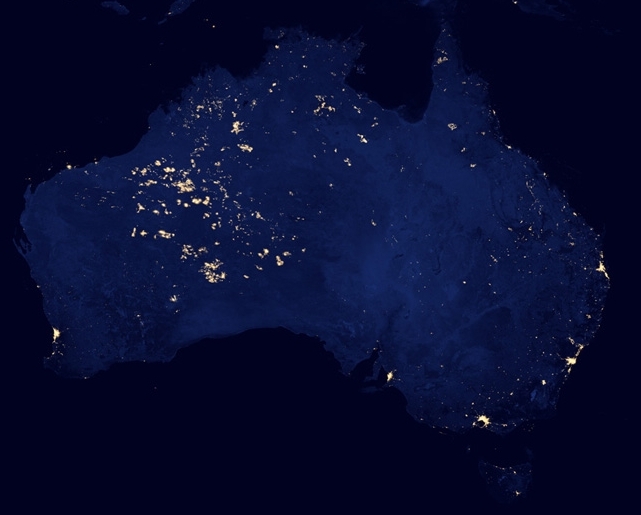 NASA provided a map supposedly showing “burn scars,” and claimed that there was a match between this map and the map of lights in Australia. But there's a huge problem here. The “burn scar” map and the light map match up fairly well for northern Australia. But the maps miserably fail to match up for the eastern half of western Australia – the very location of the lights that are hard to explain. The “burn scars” map is show below. I've added a rectangle around the eastern half of western Australia. The composite below shows a comparison between the NASA light map and the NASA burn map. 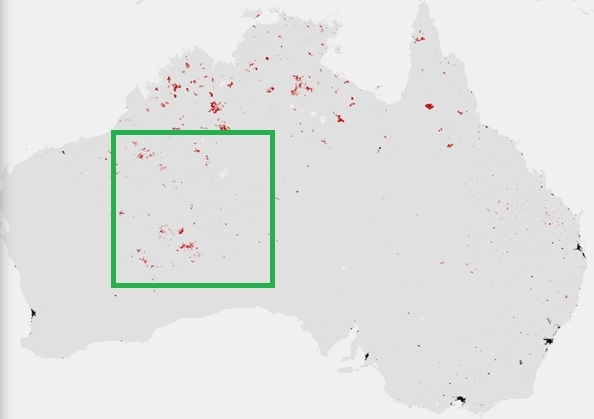 The green rectangles show the same part, a large region of the eastern half of western Australia. Now, according to NASA's claims, the red spots in the rectangle on the top should match the yellow spots in the rectangle on the bottom. But there is no match. Fewer than 10% of the yellow spots in the rectangle on the bottom match the red spots in the rectangle on the top. There are no “burn scars” in 90% of the spots where the lights were observed in the green triangle area. In short, NASA's own “burn scar” map debunks NASA explanation for the “mystery lights” in western Australia. Evidently the “mystery lights” in western Australia were not mainly caused by wildfires, for the burn scar map shows almost no trace of such wildfires. And as I discussed before, the historical record also indicates that such massive wildfires did not occur during the time that the light map was made (April and October 2012). NASA's unconvincing attempt to justify its unbelievable explanation for the “mystery lights” in Australia was reported without question by the press. It is as if no one bothered to compare the light map and the “burn scar” map and see how little they match. We apparently have here an important unresolved mystery. Unexplained lights were observed over a huge part of Australia, and we have no good explanation for them. I can merely note that as someone who regularly photographs unexplained lights in the night sky (as seen here), I do not find this surprising. Dismissal of “anecdotal” evidence. One favorite tactic of the contemporary skeptic is to dismiss any undesired evidence involving human testimony, on the grounds that it is merely “anecdotal.” The reasoning is that evidence gathered by machines or in laboratories is good evidence, but evidence that comes from human accounts is not good evidence. This reasoning makes no sense, as anecdotal evidence is simply observational evidence provided by humans, and such evidence is a large part of the facts established by science. Scientists such as zoology are largely founded on anecdotal evidence, an accumulation of anecdotes that particular observers saw particular types of animals at particular places. The skeptic likes to point out that errors might arise from human testimony because of the fallibility of human memory. But evidence gathered by modern machines may be just as prone to error, as modern scientific equipment is controlled by extremely complicated software that was programmed by ordinary fallible humans, and such software typically contains bugs. There are actually many ways in which laboratory evidence can go wrong, including software bugs, misuse of equipment, poor experimental design, manual error while taking readings, and faulty summarizing of data points. A lazy dismissal of photographic evidence because of the possibility of fraud. Another favorite tactic of the contemporary skeptic is to dismiss any and all photographs appearing to show something that he doesn't wish to believe in, on the grounds that photos can be faked. But dismissing photographic evidence because of the possibility of faking makes no more sense than dismissing all witness testimony on the grounds that witnesses can lie. 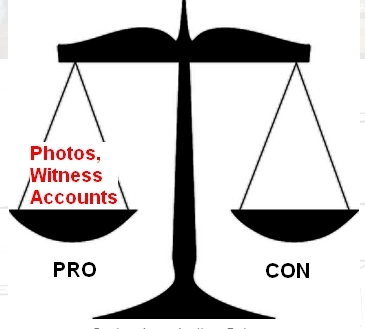 A reasonable approach is to consider a scale, one side labeled “Pro” and the other side “Con.” Until it is discreditied, each photograph that appears to show some phenomenon must be considered as prima facie evidence for such a phenomenon, and must be considered as something that is resting on the “Pro” side of this scale. The more such photographs there are, the stronger the evidence for the phenomenon. Particular photographs might be removed from the “Pro” side of the scale, by analyzing such photographs and proving they were faked (something that might be done by using a site such as fotoforensics.com). Conceivably, if there are incredibly strong valid reasons for disbelieving in something, then something on the “Con” side of the scale might outweigh a body of photographic evidence piled up on the “Pro” side of the scale. But it is just as wrong to lazily dismiss a large body of photographic evidence because of a possibility of fraud as it is to dismiss a large body of witness testimony because of a possibility of lying. If we followed the same principle of “don't count something as evidence if it might have been faked,” we would have to throw out 90% of the evidence that has been gathered by scientists. Attempts to dismiss or discredit witnesses based on their beliefs or associations. Another favorite tactic of the contemporary skeptic is to attempt to discredit or dismiss witnesses based on what the witnesses believe or what type of associations the witnesses have. This tactic is repeatedly used in an egregious manner by the pages of wikipedia.com, a web site that should never be trusted on any matter relating to the paranormal. 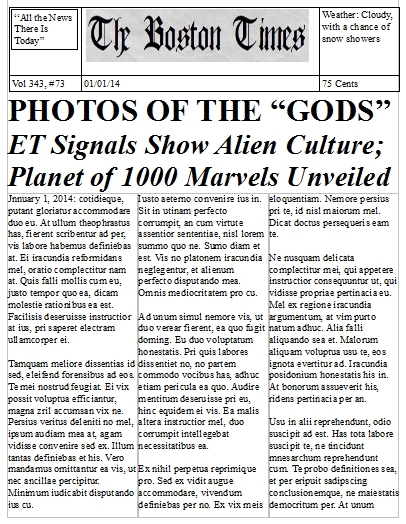 An example of this tactic is as follows: David said he saw a UFO, but some other time David indicated he believes in UFO's; so David's testimony cannot be trusted because he's a “UFO believer.” Such twisted logic is very convenient for the skeptic, as it establishes a bizarre protocol in which we cannot accept the testimony of anyone about a phenomenon if the person indicated his observations led him to believe in that phenomenon – so the only testimony allowed about a phenomenon is by witnesses who did not see convincing evidence of the phenomenon. Such reasoning is absurd. Courts have it right: their rule is all witnesses are of equal value regardless of their beliefs. A judge will never allow the testimony of a witness to be excluded on the basic of something like the religion of the witness (and a good judge will never even allow a lawyer to ask a question about the religion of a witness). A glib tendency to almost always claim that we understand the cause or causes of something mysterious, rather than to admit that such causes are unknown. The universe is teeming with a million mysteries, and what man knows about nature is very tiny compared to what man does not know. But you might get the opposite idea from listening to a contemporary skeptic. Given some baffling observations, such a skeptic will almost always prefer to say, “This is caused by X” or “This is caused by Y” or “This is caused by X or Y” rather than simply say, “We do not understand what causes these observations.” This is an egotistical form of intellectual hubris. Ignorant little fledgling beings like ourselves (in some ways like plankton in the great cosmic ocean) should not claim to understand things that we do not understand. A tendency to uncritically accept the orthodoxy of a favored authority. In ancient times skeptics were those critical of all authorities. Such skeptics maintained that all human knowledge was subject to doubt, and that no human authority (whether scientific, philosophical, religious, or governmental) could be regarded as a source of certainty. But the contemporary skeptic typically has a very different attitude. The contemporary skeptic seems to be always bowing down prostrate before the authority of scientific academia. Such a skeptic throws away all skepticism when considering the opinions of academics, and seemingly regards their opinions as a kind of sacrosanct holy writ, to be treated as reverently as a papal encyclical. This type of attitude is the exact opposite of the attitude promoted by the original skeptics of ancient times, causing many people to say that contemporary skeptics should be called pseudo-skeptics. The modern skeptic often acts as a kind of orthodoxy enforcer, an agent of punishment for those who deviate from the entrenched dogmas of materialist thought. Luckily our legal system does not operate according to the principles of contemporary skeptics. But it is interesting to consider: what might happen if a jury were to decide a court case using such principles? Let us imagine a jury deliberating a murder case while following such principles. Foreman: Well, here we are, ladies and gentlemen. We finally get to decide this murder case after listening to 5 days of testimony. Should we find Sister Mary Agnes guilty of murdering her 98-year-old mother, or should we find her innocent? We must now decide. Let's now try to remember the key parts of the testimony we just heard. Jane: I remember the testimony that all those nuns gave. Ten nuns testified that on the night the mother of Sister Mary Agnes died in Paris, Sister Mary Agnes was working with them in their convent near Los Angeles, almost 6000 miles away. That sounded pretty convincing, so shouldn't we just vote “not guilty”? Foreman: No, not at all. You see that testimony was merely “anecdotal” evidence, and anecdotal evidence isn't real evidence, at least not like evidence provided in laboratories. Since the testimony of the ten nuns was just anecdotal, we should just ignore it entirely, and count it as nothing. John: Okay, so we'll ignore that testimony. But what about the photographs? The defense produced 24 photographs showing that on the night her mother died in Paris, Sister Mary Agnes was in Los Angeles, almost 6000 miles away. Foreman: But that evidence doesn't count. Those were just photographs, and photographs can be faked. Jim: Okay, so we'll ignore the 24 photographs. But what about the testimony of the nurse in Paris? She said that she saw the mother of Sister Mary Agnes die, and that nobody killed her. Foreman: Well we certainly can't accept that testimony. She was a nurse in a Catholic hospital, and you know how those Catholics are. Don't forget, we must always be ready to disqualify a witness whenever that witness holds beliefs that clash with our own preconceptions. Walter: Okay, so we'll throw out the testimony of the nurse. How do you think we should vote: guilty or not guilty? Foreman: In this matter we must respect the revered authority of the prosecution. The state has put Sister Mary Agnes on trial, and can we believe that this esteemed authority has got things wrong? Jane: That would be pretty unlikely. Once you get to be an esteemed authority, you're always right, I would imagine. So it seems we have a reason for voting “guilty.” Is there any other reason? Bill: So I see how the consensus is developing. So let's see a show of hands: do we all agree to vote guilty? Foreman: I see twelve hands raised, so the matter is decided. We will tell the court we have voted that Sister Mary Agnes is guilty of the heinous murder of her mother. Thankfully the case of Sister Mary Agnes is purely imaginary. The reality TV show has long been a staple of television. But what type of reality TV shows might we see in the future? Below are some possibilities. Brute vs. Cyborg: This reality TV show will be an athletic competition or a fighting competition between tall muscle-bound weightlifters and short weak-looking nebbish nerds whose limbs have been technologically enhanced with electronic hydraulic enhancements giving them super strength or super speed. Say As I Say: In this reality TV show, a man with a professional position (such as a lawyer or business man) is given a pair of special camera glasses that provide a real-time video feed to a distant listener, along with a hidden microphone providing a real-time audio feed. The man also has an ear device that picks up audio transmissions from the listener. Throughout an entire day, the man must only say things he has been prompted to say by the remote listener, who sees and hears what the man sees and hears. The listener is an ordinary lower class guy such as a street peddler. Can an ordinary guy “fill in the shoes” of some professional for an entire day? Holographic Horror House: In this reality TV show, a group of participants is told that as part of a reality TV show, they will be sleeping in a haunted house overnight. They observe terrifying translucent ghosts, but the ghosts are just holographic projections that are projected from special devices in the floor and ceiling. To capture authentic terror, the real name of the TV show is not revealed to the participants until the filming is finished. Gang Versus Robot: An intimidating street gang faces off in combat against a steel robot. The combat takes places in a studio set simulating a back alley in a big city. The robot has high-tech tools like a taser gun and a projectile launcher. But the street gang has plenty of grit, and can make use of trash cans and other familiar items as part of its assault against the robot. Survivor Suburbia: In this reality TV show, a group of participants is transported to a suburb far from a city, a suburb that was abandoned after Peak Oil caused oil prices to skyrocket, because people could no longer afford the cost of the commute. How can the participants survive in suburbia when there are no stores, farms, or inhabited houses nearby? Rembrandt For a Week: Five participants with no known artistic talents are put in the hands of neurologists who have mastered the finest in electrical brain stimulation that causes a surge in creativity. Which of these “Rembrandts for a week” will produce the greatest work of art? 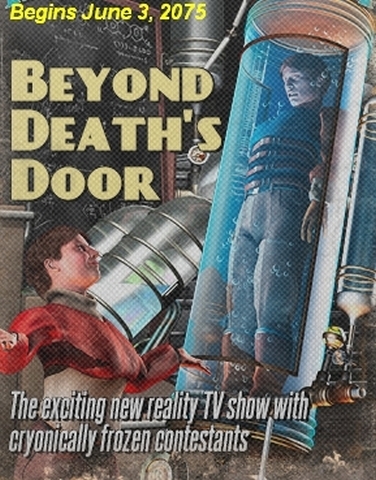 Beyond Death's Door: After the first frozen dead person has been successfully revived from cryonic suspension, this reality TV show will feature participants who willingly commit suicide in interesting ways, and then are immediately frozen. The winner is the first person to be successfully revived from cryonic suspension. Pick Your Hell: In this reality TV show of the late 21st century, participants are given a choice between living in four nightmarish living places: the surface of Venus, a radioactive wasteland caused by a nuclear meltdown, an overpopulated city with air three times worse than modern Beijing, or the streets of Miami that are constantly flooded by rising global sea levels. The first contestant to live two weeks in his chosen environment wins. Gene Gamble: In this reality TV show, contestants spin a giant spinning wheel. The result determines what type of experimental gene modification will be applied to them. Some may get increased speed, stamina, or intelligence, but others may find themselves with some weird mutation. After the show is taped, the gene changes are reversed. Real or Robot? : In this reality TV show, blindfolded participants are asked to intimately interact with a body that may be a real living human or merely a sophisticated android robot. Guessing correctly to "real or robot?" causes contestants to move up to higher levels of physical engagement. Nowadays the term “anti-science” is being used in some fairly ridiculous ways. The term should rightfully be reserved for those who are opposed to the scientific method, or who reject the majority of scientific findings established by some large branch of science. But nowadays I read many people abusing the term “anti-science.” Writers nowadays are often throwing around the term “anti-science” as a term of abuse used against those who reject particular technological choices. Such charges are usually absurd, because technological choices should not be confused with science. Such reasoning is absurd, because a GMO is not science. It is a technological product made using some scientific knowledge. So is a Justin Bieber CD, which is a product made using scientific knowledge involving electromagnetism. If you decide not to consume GMO's, this would be no more “anti-science” than choosing not to purchase a Justin Bieber CD. Genetics is a science, but genetically modified organisms are not science. They are a technological product. It is also an abuse of language to be using the term “anti-science” against people who choose not to use particular medical products, even vaccinations. Now let me make it clear: I believe in vaccinations, and I have made sure that my children have all the required vaccinations. If a person chooses not to get vaccinations for himself or his children, that is a decision that may be rightfully criticized in several sound ways. But a charge of being “anti-science” is not one of them. An injection is not science; it is a technological product. A person should never be charged with being “anti-science” because he chooses not to consume a particular technological product. 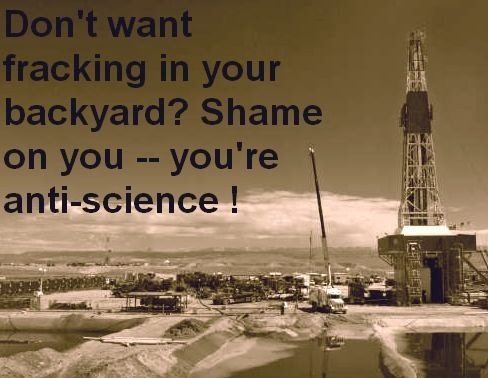 But proponents of fracking sometimes try to make the issue real simple: fracking uses science, so if you oppose fracking, you're anti-science. During the 1950's the government started to test nuclear bombs in Nevada, blowing up more than 100 A-bombs in the atmosphere. The health effects for people living downwind of the tests were often devastating. Those who complained about potential health risks were labeled as “anti-science,” "anti-American,” and “anti-progress.” We were assured by numerous authorities that nuclear fallout was pretty harmless. This is something to remember the next time you hear someone being labeled “anti-science” for expressing reservations about some product or activity. Joanna woke up, and noticed that dust had got inside her bedroom. “Sorry,” mumbled Bill. The couple got up, dressed, and had breakfast. “So who's gonna get the water today – you or me?” asked Joanna. “I'll do it,” said Bill. Bill and Joanna's apartment had a nice bathtub, and a nice kitchen sink. But there was no running water. After years of the long drought, their local municipal government in California had stopped providing running water to average citizens in the year 2052. Global warming was making the drought much worse. So there was only one way for Bill to get water: he had to go to a local store, buy a 5-gallon jug, and carry it home. The water ran out pretty quickly, as it had to be used to flush the toilet. So Bill and Joanna didn't take showers very often. Bill was halfway out the door when Joanna had a reminder. “Bill, you forget something?” she asked. “I got the cash,” said Bill. “Oh, yeah,” said Bill, grabbing the mask. He started out the door again. “Oh yeah,” said Bill, grabbing the goggles. As he walked to the store, Bill wished that he had a car so he wouldn't have to lug the big water bottles back from the store. He once had an old used car, but he had sold it after he got tired of the chore of having to brush off the dust from the windows each morning. At least I have a good pair of goggles and a good dust mask, thought Bill; pity the poor people who walk around in this swirling dust without protection. The water line at the store was too long, causing Bill to curse. He finally got his 5-gallon jug of water, paying 50 dollars. A large fraction of Bill and Joanna's income went just to pay for water. Bill headed back home. But on the way back, he had a cruel surprise. A man approached him, and pulled out a knife. “Your water or your life,” the man with the knife said. Bill handed over the water bottle. He sadly walked home, and opened the door. “Don't worry, I'll take care of it,” said Bill. It was time for desperate measures. Bill looked in his closet, and got out a crowbar. Bill then searched the streets for a car where no one was nearby. He used the crowbar to pry open the hood. He yanked out the water bottle that stored water used to clean the windshield. He tasted the water. Finally, after breaking open the hoods of six different cars, and looting the water supplies of three of the cars, Bill was able to collect enough water for him and his wife to drink for the rest of the day. Elsewhere in the city, Caldwell and Bethany were having no water problems at all. They lived in a luxurious mansion surrounded by green lawns watered every day by sprinklers. In the back of the mansion was a large fountain that ran all day long. Their home had not just running water, but two large swimming pools – an indoor pool and an outdoor pool. Robots with water sprayers kept the dust off their gleaming home. Caldwell was splashing with his friends in his huge outdoor pool filled with clean water. One of his friends had a question. Orbs are circular anomalies that have been observed in many flash photos. You can see very many examples of orbs by looking at this list of web sites or this web site. These are often big, bright, colorful orbs that often appear to resemble faces, and many of these orbs appear to be moving very rapidly (as you can see by looking at this poster-type image). But skeptics often claim that orbs are just dust. They advance the theory that when you take a flash photograph of orbs under some ordinary conditions, you are really just photographing tiny specks of dust in front of the camera. This theory is wrong, and I can tell you by how much of a factor it is wrong. The theory is wrong by a factor of 1000 times, and is therefore as wrong as the claim that you can buy a shiny brand new car for only 20 dollars. 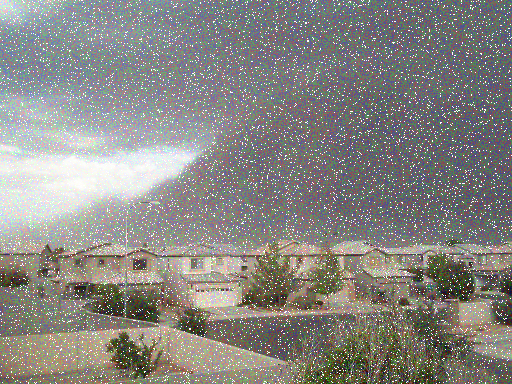 The particles of dust in ordinary air are about 1000 times too small to produce conspicuous orbs in your photographs. To support this claim, I will present a logarithmic chart of particle sizes. The chart is very similar to many charts that have already been published, except for the yellow and green parts. You can find many similar charts on the Internet by doing a Google image search for “particle size chart.” One such chart can be found here. My chart uses the same estimates found in such charts. 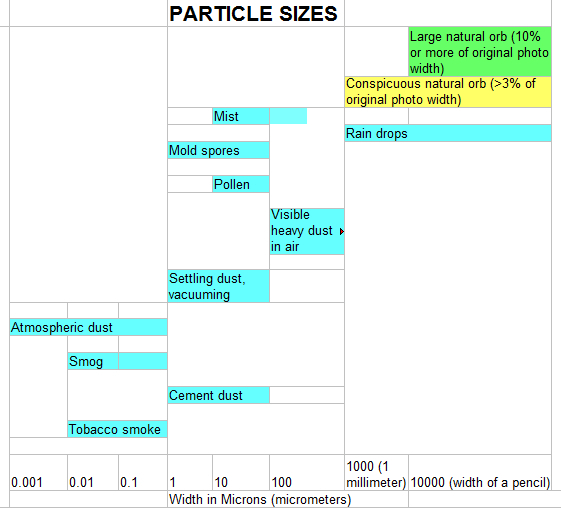 There is no real controversy or debate about the particle sizes of the items I have listed here in blue – the great majority of the “particle size” charts list the same estimates I have listed here (although some list “heavy dust” as being no larger than 500 microns). In this chart I list in yellow a range of particle sizes that might produce a conspicuous natural orb in your photograph because of a camera flash reflecting off of a particle in front of your camera. I define a “conspicuous” natural orb as one that has a size greater than about 3 percent of the original width of the photo. The word “original” here is crucial. By original, I mean the photo before any cropping has been done. Note that the maximum size of ordinary atmospheric dust is only about 1 micron. But what is the minimum particle size that might produce a conspicuous natural orb in a normal photo, one greater than about 3% of the original photo width ? My experiments tell me that the size is about 1000 microns, or about a millimeter. By a normal photo I mean a photo taken with a normal camera setting as you might use to photograph a person, not some “macro-mode” photo in which the camera lens is extended way out (as you might use to get a closeup photo of a tiny object). I have done tests pouring cinnamon powder near the camera, which produced no orbs. Cinnamon powder has a particle width of about 70 microns. I have done tests photographing while vacuuming, which should have raised dust levels to as high as 100 microns. These tests produced no orbs greater than 2 percent of the original photo width. I have done tests photographing steam produced by photographing in a steam-filled bathroom. This should have created particle sizes of about 300 microns. No orbs were observed. I have done tests photographing mist sprayed in front of the camera, mist from a plant sprayer. This should have created particle sizes of between 100 and 500 microns. This produced a few very small “orbs” (really just droplets), but none that were “conspicuous” as defined above (none greater than about 3% of the original photo width). So based on these tests (which all used flash photos), I can conclude that when using a normal camera setting (not “closeup photography” settings), you need a particle size of at least about 1000 microns to get a natural dust or vapor orb that is “conspicuous” as defined above (having more than about 3% of the original photo width). There is an entirely separate reason for drawing such a conclusion. No camera expert thinks that dust particles can be photographed within about 2 inches of the camera lens, so those who maintain that orbs are produced by dust tell us that dust is being photographed in a little “orb zone” area a few inches from the camera lens, in front of it. Such an area would have a length that could not be smaller than about 30 millimeters, about the width of a half dollar coin. So if a dust particle were to appear in such an area blocking more than 3% of the original photo width, how big would it have to be? Apparently about 3 percent or more of this small area that is no smaller than 30 millimeters long – in other words, about a millimeter (the same as 1000 microns) or larger. If one assumes an even larger "orb zone" width of greater than 30 millimeters, than an ever larger particle size would be needed to block 3% or more of the photo width. So both the results of experiments and camera field considerations lead us to the conclusion that under normal camera settings (not close-up photography settings) you need a particle size of at least about 1000 microns for some dust or water particle to produce a conspicuous orb in a photograph (one that is more than about 3% of the original photo width). But the particles of dust in ordinary air do not have such a size. Instead they have a size about 1000 times smaller, a size of only about one micron or less. This is why when skeptics claim that photos of prominent orbs taken in ordinary air are showing particles of dust, they are off by a factor of 1000, and are making a claim as wrong as the claim that you can buy a shiny new car for $20. Could it be that when someone photographs an orb they might be photographing the “visible heavy dust” listed in my chart? No, that refers to the kind of dust you get in things like a steel foundry, a building collapse, or a volcanic eruption – dust so thick you can see the particles in front of you, and feel the particles collecting on your skin. Particles larger than about 10 microns can be seen with the eye. Judging from this link which gives results from a fancy electronic particle counter, we should not at all expect particles of more than 10 microns to be floating around in typical air in residences or offices, and the particles in such air are mostly less than 1 micron. But could it not be that when you are photographing an orb, you are photographing some relatively large particle of dust raised by some event that happened a few hours ago? No, it is not possible. This is because particles of dust larger than 10 microns always settle to the ground fairly quickly. This is shown by the chart below, derived from a chart at this URL. As we see from this chart, it takes only about six minutes for a 100 micron particle to fall a meter (about 3 feet), and dust particles of 1000 microns or larger have about the same settling velocity. While the dust particles in ordinary air (too small to produce orbs) take quite a while to settle to the ground, all of the larger dust particles above 10 microns settle to the ground fairly quickly at a rate of about a meter per six minutes. That means that unless some dramatic dust-raising event occurred very close to you within about 10 or 15 minutes of the time you took your photo (such as someone knocking out a wall, beating a rug with a stick, or toppling a large book case), there is no significant chance that conspicuous orbs produced in your photo are caused by dust. This link has 11 photos of orbs that are more than 10 percent of the original photo width. How large would a dust speck have to be in order to produce such a large orb? It would have to be about 10,000 microns, larger than the width of a pencil (almost as wide as a dime). Such dust simply doesn't exist, not even in buildings that are being demolished. It is generally agreed that the maximum size of heavy dust is only about 1000 microns. It would seem that our skeptical friends who claim that most orbs are just dust simply have not bothered to do their homework. Judging from their web sites, they apparently haven't done the experiments they should have done, and apparently haven't bothered to thoughtfully research the size of particles. So it's not surprising they've come up with an answer that is off by a factor of 1000. The basic idea is to drop or spray small particles close in front of the lens of the camera while taking flash pictures of an object beyond. This should yield orbs. Various solids (like flour, cinnamon, etc) can produce some pleasing, typical-looking orbs. Such a recommendation is, of course, ridiculous. A theory that can only explain orb photos when people drop or spray particles in front of the camera is worthless for explaining 99% of all orb photos, which were not taken under anything like such absurdly extreme conditions. The bottom line here: the orbs in the great majority of the better orb photos on the Internet are not photos of dust, because they were almost all taken in ordinary air, air in which the average dust particles are 1000 times too small to produce conspicuous dust orbs. Postscript: See this post for a mathematical analysis comparing the size in front of a camera and the size of particles in the air. The analysis finds that the "blockage fraction" of a particle of dust in typical air is way too small to produce noticeable orbs. The analysis also explains why neither pollen nor common water vapor can explain.orbs.